Grangewilliam Stud’s Zabeel sire Zed was represented by his ninth stakes winner when Bobby Dazzler won Saturday’s Listed Wanganui Guineas. Bobby Dazzler (Zed x Tutuland by Green Desert) is trained by Stephen Marsh and had to endure a stewards inquiry into interference in the concluding stages. He is part-owned by his breeders John, Mark and Rachael Carter, two brothers and a sister who race under their Jomara Bloodstock banner. The win completed a stellar week for the trio as they also bred and share in the ownership of G1 Memsie Stakes winner Humidor. •	Savabeel filly Peaceful posted a classy win in the Listed Fillies Stakes at Wanganui for the Murray Baker and Andrew Forsman stable. 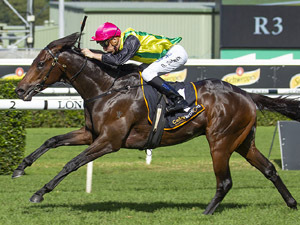 Peaceful (Savabeel x Paloma by Mossman) closed off last season with a victory in the Listed Great Northern Foal Stakes and picked up where she left off beating London Express (Shamexpress) and Tutta La Classe (Per Incanto). Baker confirmed they plan to take the filly to Melbourne later in the spring. Peaceful has now had six starts for two wins, three placings and $74,350 in prizemoney. The filly was bred and sold by Westbury Stud at the 2017 NZB Premier Sale at Karaka where she was purchased by Bruce Perry Bloodstock for $260,000. •	Sai Fah, a colt by Rios, took out New Zealand’s first two-year-old race of the season at Wanganui. Sai Fah had won two trials at Te Teko last month and the Stephen Marsh-trained colt did enough to win the 800m after a head-to-head battle over the final 200 metres with First Rock (El Roca). Alto Potzena, by first season sire Proisir), finished third. Sai Fah, out of the Fast N Famous mare Rongonui, was sold at the NZB National Weanling, Broodmare & Mixed Bloodstock Sale in 2017 by Waikato Stud to Mission Downs Trust for just $6000.